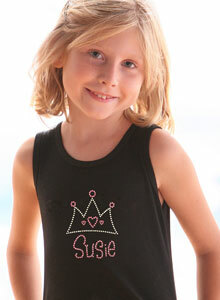 Girls love sparkling clothing, especially when it is personalized with a name. 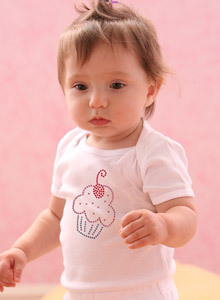 Just Jen creates adorable girls rhinestone T-shirts and clothing from baby to youth sizes. Choose our one-of-a-kind designs below, or create a custom T-shirt for your baby or youth, with our Girls Custom T-shirt. This darling shirt features a crown, embellished with a sweet heart. It can be personalized with her name. Our Big Initial shirt designs features the letter of your choice, along with a name. The Polka Dot Number shirt is the perfect piece to complete a perfect ensemble, or to celebrate her age. This fun design features crystals in bright, alternating colors and the number of your choice. Customize this adorable Miss design with your state, a name, or any other word of your choice. Make this t-shirt one-of-a-kind by adding her name and initial. Help her grow in style with our Girls Age t-shirt. Choose the number and colors of your choice, or even add a name -- this tee makes a great birthday gift! 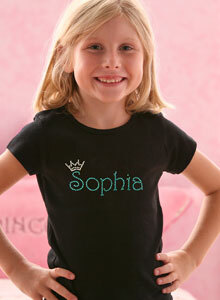 Your little girl will look like royalty in this tee, complete with her name and a cute crown over the first letter. 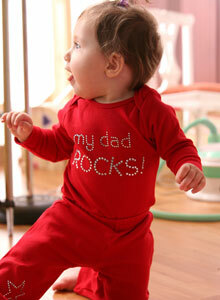 Give Dad the credit her deserves with our My Dad Rocks! design. Available in a variety of infant and girl's styles. 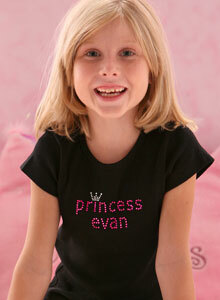 For a great gift that she won't forget, personalize this Princess shirt with her name and favorite color. Let the world know her star power with this Superstar t-shirt! This Girls Team Jersey features the name and number of your choice in glittering crystals. These Cupcake Sweat Pants are simply adorable, and are the perfect companion for our Cupcake t-shirt! Lovely little crystal lady bugs adorn this sweet hoodie. Our Lady Bug Sweat Pants feature four sweet lady bugs across the back, and are a perfect match for your Lady Bug Hoodie. Let the world know how great Mom is with your My Mom Rocks! t-shirt design. 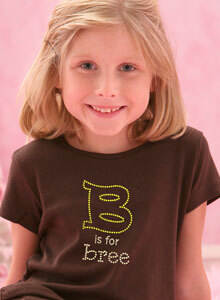 This sweet and simple Girls Initial t-shirt features her initial in dazzling rhinestones. A cursive rhinestone initial gives a classic touch to this hoodie. Our Girls Initial Sweat Pants feature the rhinestone initial of your choice, and match our Girls Initial Hoodie. 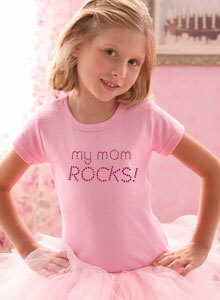 Show the world who your daughter's BFF is with this adorable crystal t-shirt. This shirt is a mom-sized version of our Girls Mommy and Me BFF tee. Get one to match your daughter's! Our fabulous Super "Star" t-shirt will give her a touch of glam. She's definitely your mini-me, and now you can tell the world with this adorable rhinestone tee! Our Me t-shirt is the perfect piece to match our Mini-Me t-shirt. Get one to match your daughter! You want your gifts to be the hit of the party, so why not give her a gift that is as unique as her personality? 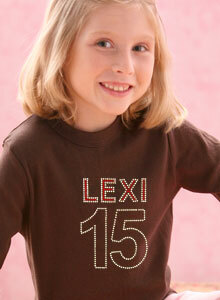 A sparkling rhinestone girls t-shirt personalized with her name or age will be a big hit.